2010 NFL Predictions: Will TO and Ochocinco play nice? 2010 NFL Predictions: Will TO and Ochocinco play nice? As the Vegas odds makers set the NFL odds for the 2010 NFL predictions season you have to wonder will TO and Ochocinco play nice in Cincinnati? And, just as importantly, what will their end zone celebrations look like if they are both on the field for a touchdown? 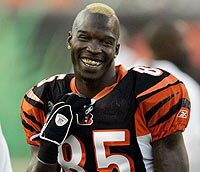 With the tragic death of Chris Henry, the Cincinnati Bengals had a huge void at wide receiver and the signing of Terrell Owens gives them a much-needed running mate for Chad Ochocinco. Owens was a bust in Buffalo last year but, at his best, he is a playmaking receiver who draws coverage. In Buffalo, he was a one-man gang but with the Bengals he will have help with a top quarterback in Carson Palmer, running back Cedric Benson, and fellow wide receiver Antonio Bryant, another off-season free agent pick-up. The offense should score more points in the 2010 NFL predictions season but the defense needs to get better if the Bengals are to improve on their 9-7 record from a year ago. The Jets ran all over the Bengals in their upset victory on Cincinnati’s home field. Their front four does not scare anyone but the linebackers have the pedigree and talent to be special. Rey Maualuga and Keith Rivers, both drafted high from USC, have yet to show significant production in the NFL and they need to show their stuff in 2010. The Bengals also signed ex-Cowboy Roy Williams to patrol the middle. Williams is a hard hitter but prone to miss tackles while looking for that knock-out punch. The corners are solid, with Leon Hall and Johnathan Joseph. The Bengals also signed Adam “Pac Man” Jones, notable for the added entertainment value, if nothing else. Their 12-1 NFL odds to represent the AFC in the Super Bowl suggest they will need improvement on defense and production from Owens and Bryant to make the leap, but, you can bet the house they will be fun to watch. Get the best Vegas NFL odds and a $250 Bonus when you open your 2010 NFL predictions account at Sportsbook.com.